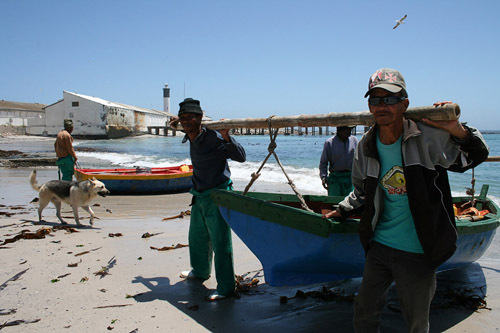 A cooperative established with a R3 million government grant given to a group of 120 fishermen in Doringbaai and Ebenhaezer on the West Coast could act as a model for the rest of the country’s small-scale fishermen who have been struggling to sustain their livelihood in the face of fishing quota restrictions. Doringbaai fisherman, Hahn Goliath, said the divisions and grief the fishing quota system has caused within the community, led the fishermen to approach the Department of Trade and Industry (DTI) for funding. The grant which was handed over last month is intended for the establishment of ten co-operatives, the purchase of much needed equipment and boats, and courses in health and safety. Goliath said the 2005 government policy on the Allocation and Management of Long Term Commercial Fishing Rights largely excluded the small-scale fishermen, leading to increased poverty and family breakdowns. He said that large commercial fisheries “took more than half the cake” when it came to quota allocation and that the quotas allocated to small fishermen were hardly enough for them to survive on. “If fishermen are not successful (in getting quotas), they can’t fish. There are teachers and lawyers with allocations but people near the sea have no income and can’t put bread on the table. You then have children dropping out of school, and the drugs and teenage pregnancies are high. The individual quota system does not empower the people,” he said. “We are struggling with resources now, but by pulling our resources together (through the co-operatives), we can achieve more,” said Goliath. By establishing co-operatives, the fishermen hope to re-unite the community and protect their tradition of living off the sea. “We want to bring back the tradition of small scale fishing, to protect it. We need to … stand together as a collective. We also cannot wait for government. We hope that other fishing communities can take this lesson from us and be inspired (to help themselves),” said Goliath. Although the fishermen will be involved in running the co-operatives, the group has assigned a respected and knowledgeable community member to guide them in the management thereof. The groups will also receive six months training in budgeting and management from government. Senior lecturer at the Institute for Poverty, Land and Agrarian Studies, Moenieba Isaacs, said the co-operative system would work if the money was used wisely and if the fishermen as a collective could engage with the market. Benefits needed to return to them as a collective rather than one individual managing the co-operative and benefiting exclusively from it. With the support of DTI and the Department of Agriculture, Forestry and Fisheries (DAFF), fishers could be trained to manage the co-operatives, said Isaacs. She added that the funding given to the Doringbaai fishermen could act as pilot case study for other fishing communities. “The money allocated to these communities could implement some of the proposals made in the small-scale policy and act as pilot case studies for many other coastal communities along the coast,” she said. The small scale policy Isaacs refers to is the draft policy for the Small-Scale Fisheries Sector which was made available for public comment in August last year. Director of Masifundise (an NGO working with small fishing communities), Naseegh Jaffer, who was on the task team to develop the new policy, said it had “sweeping new proposals” designed to accommodate small fishermen, creating equity rather than competition. The proposals include a removal of the quota system, that small fishermen be allowed to catch multiple species of fish rather than just one, and that instead of sharing waters with commercial fishers, small fishermen be given an exclusive zone from which to fish. Isaacs said the fisheries co-operative could address some of the issues not included in the draft policy. “A key issue that the small-scale policy is neglecting is what species would be allocated to the fishers,” she said. Other issues were seeing what value could be added to existing species, the role of aquaculture, the activities of women in the post-harvest sector and linking the co-operatives to tourism in the area. Provided appropriate skills were given the fishers and extension support from DAFF, the fisheries cooperative could successfully deal with all these issues.